Emma Johnson joined us a an intern in Ancient Mediterranean and Islamic Art this June. Today, on her last day with us, I asked her to share her “Five,” her top five favorite objects from our collection. I think her choices are pretty great. Do you? What are your favorite SAM objects? After being at SAM for only three short weeks, I didn’t know how I could possibly choose five pieces of art that were my absolute favorite, as my supervisor Sarah Berman had requested. But after wandering through each gallery, several pieces stood out to me. Objects have always caught my eye more than paintings or other mediums so each piece I have selected is an artifact, not something hung on a wall. 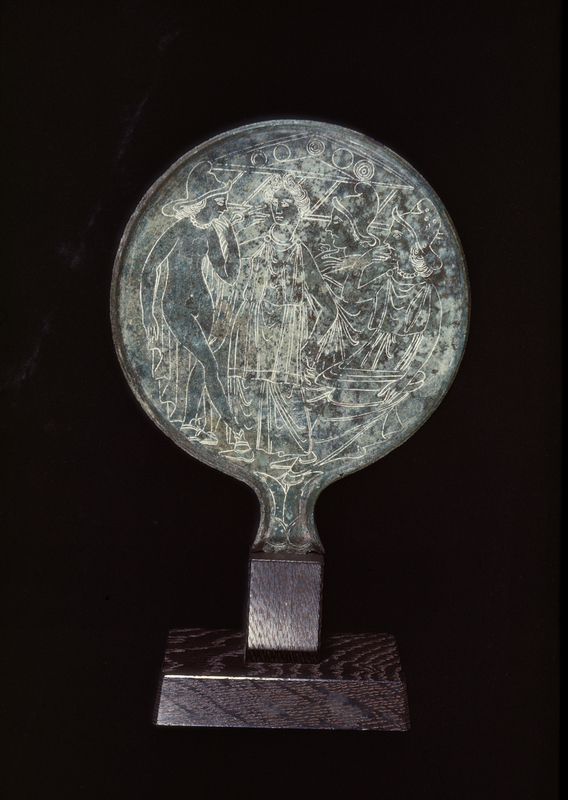 Mirror with scene of the Judgment of Paris, 4th-3rd century B.C., Etruscan, `bronze, 10 3/8 x 7 in., Eugene Fuller Memorial Collection, 48.36. 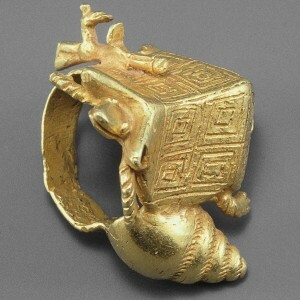 Currently on view the Ancient Mediterranean and Islamic Art galleries, 4th floor, Seattle Art Museum. As a Classics major, ancient Greek myths are pieces of history that I find fascinating. 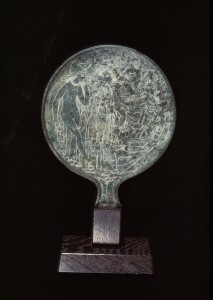 One of my all-time favorite myths has always been the Judgment of Paris, so when I discovered an ancient mirror with the judgment scene etched into the back of it, the piece immediately claimed a position in my “top five.” As the ancient story goes, Athena, Hera, and Aphrodite, three Olympic goddesses, asked Zeus to choose who among them is the ‘fairest of them all.’ Not wanting to create further drama among the goddesses, wise Zeus tells the Trojan mortal, Paris, to make the final decision. Each goddess quickly approaches Paris with a bribe, attempting to win him over in order that he chooses her. Hera offers to make Paris a king. Athena tells Paris she will give him the skills and wisdom every man needs in war. Lastly, Aphrodite promises him the most beautiful woman in all the lands, Helen. Paris excitedly chooses Aphrodite as the winner, as no man could ever turn down beautiful Helen. However, Helen is the wife of the Greek King Menelaus. Angered by this transaction, Menelaus seeks revenge and thus the Trojan War begins. 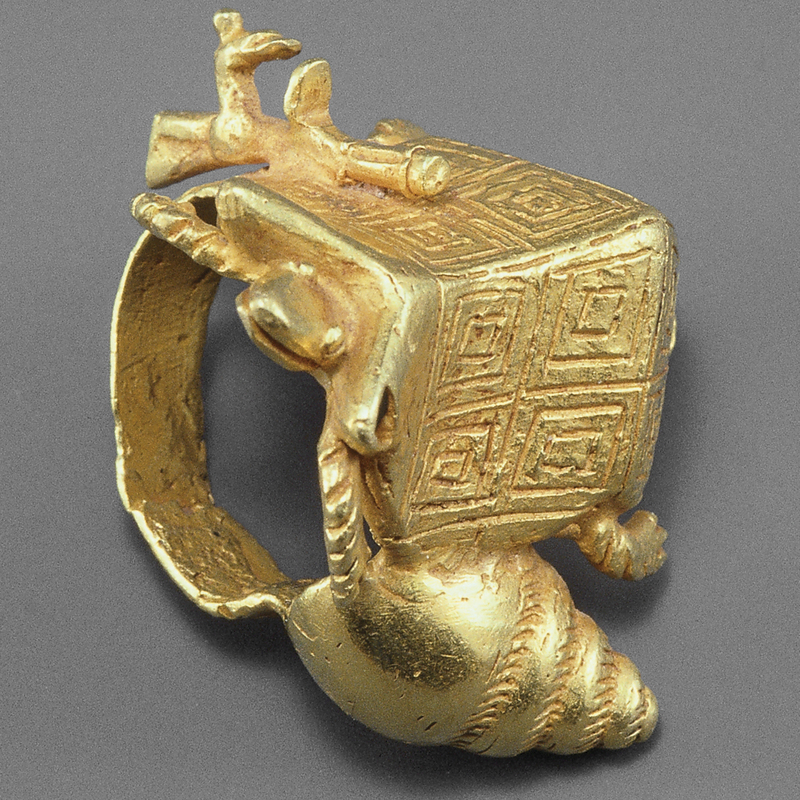 Ring, Asante, Ghanaian, gold, 1 3/16 x 1 5/8 x 1 1/2 in., Gift of Katherine White and the Boeing Company, 81.17.1684. Currently on view in the African Art galleries, 4th floor, Seattle Art Museum. Kantharos with Satyr and Maenad Heads, ca. 1st century, Roman England, ceramic, 7 1/4 x 6 in., Eugene Fuller Memorial Collection, 47.108. Currently on view in the Ancient Mediterranean and Islamic Art galleries, 4th floor, Seattle Art Museum. 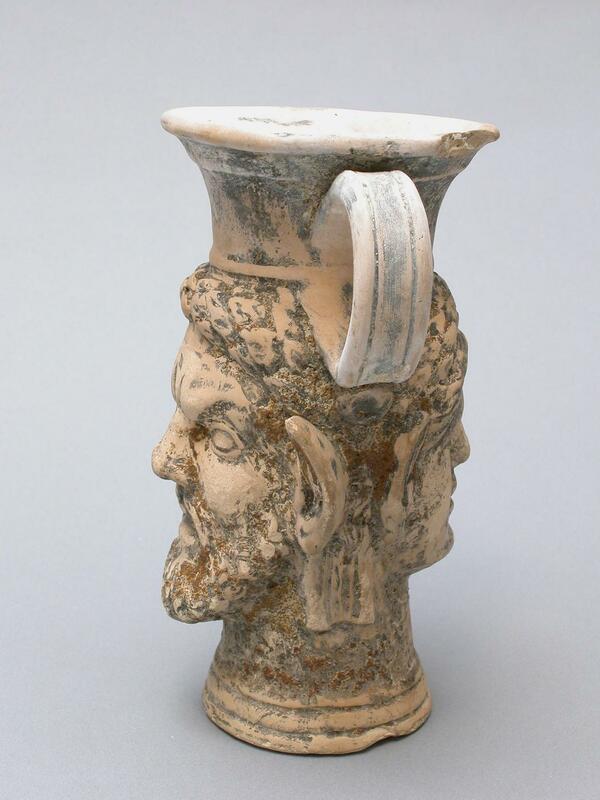 Back in the Greek and Roman collection is another of my favorites, a ‘kantharos’ or cup for wine. On either side of the cup is a head; on one side of a maenad and on the other of a satyr. Both are mythological creatures who are followers of Dionysus, the wine god. I love that on an object made for wine there are the two symbolic representations of drinking. I also find this piece interesting because the satyr and maenad look simple and peaceful while usually they are depicted during a Dionysian rite in which they are in an altered state of mind. 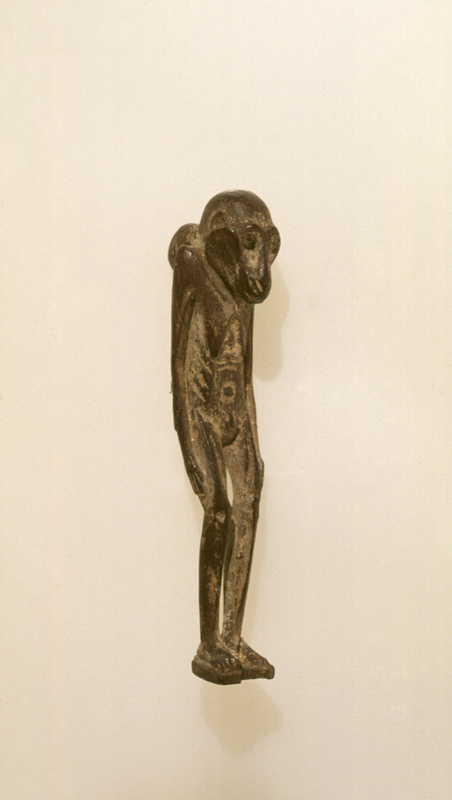 Amulet with mummified monkey, Egyptian, Early Dynastic period (ca. 2920 – 2649 B.C. ), wood, 3 3/16 x 11/16 x 7/8 in., Eugene Fuller Memorial Collection, 55.136. Currently on view in the Ancient Mediterranean and Islamic Art galleries, 4th floor, Seattle Art Museum. On the first day of my internship, a guard pointed out the small amulet of a mummified monkey and informed me it was one of the oldest objects in SAM’s collection. The monkey became a favorite because of its age. Made somewhere between 2920-2649 BC, the old age of it fascinates me. While I do not know much about the monkey, it is still one of my favorites here. Divination Container (Opon Igede Ifa), Areogun (Yoruba, African, 1880-1954), wood, 21 1/2 in. diam., Gift of Katherine White and the Boeing Company, 81.17.621. Currently on view in the African Art galleries, 4th floor, Seattle Art Museum. Lastly, a wooden divination container caught my eye as I was walking back from the ancient Mediterranean gallery. The container by Nigerian artist Areogun is easily in my top five favorite pieces at SAM. 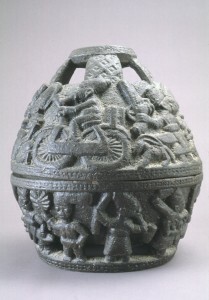 It is used to hold the diviner’s ritual equipment but is so elaborately decorated. As I looked into more information about the object, I learned that the detail of the carvings were a sign of the diviner’s success. I find it incredible that an everyday object can have such significance in one culture, but be completely mundane in another. From this assignment, I learned that I cannot simply choose a favorite item solely by looking at the art. My favorites became my favorites once I had learned the story behind each piece and heard the details which made it unique. Learning about all of these objects’ stories, is what made my internship at SAM so useful and interesting.